It seems that each time a Robert Altman film leaves Netflix, another one appears, H.Y.D.R.A.-like, to take its place. In this case one could argue it was a fair swap. Out with Cookie's Fortune, in with M*A*S*H, the director's first big hit? Yes, please—especially if you've never seen this anarchic, groundbreaking comedy that marked the beginning of a long career filled with nearly as many highlights as lowlights—which is saying a lot, considering Altman's numerous duds. (They can't all be winners, right? Just ask Woody Allen, who's having a career resurgence similar to Altman's in the '90s.) 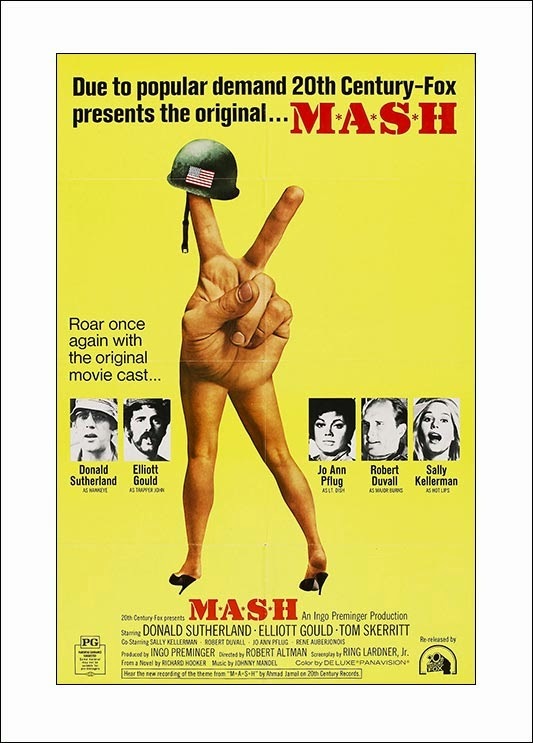 Not only did M*A*S*H spark the careers of Altman, Elliott Gould, Donald Sutherland, and Sally Kellerman (among others) while providing the template for one of television's most successful TV shows, it also introduced a new mode of screen comedy (raunchy and adult), a loose, semi-improvisatory acting style, and a level of overlapping dialogue not heard since 1940's His Girl Friday. The advances in sound recording and mixing alone make M*A*S*H noteworthy, but of course that's ignoring the realistically casual performances and still-shocking black humor. Sure, some of the political incorrectness and a seemingly endless football finale may draw frowns, but the film retains a freshness and daring that ensure its place in the pop-culture canon. Not to mention it makes the characters on the ensuing TV series seem practically neutered. A lot of unlikely films, by today's standards, were box-office successes in the 1970s. But even in a year when movies like The Last Picture Show and McCabe & Mrs. Miller became hits, Harold and Maude was a bit too dark and weird for 1971 audiences. It wasn't until the 1980s, in fact—after it had achieved cult status—that the film finally earned back its $1.2 million budget. Since then it's been enshrined as one of cinema's more revered romantic/black comedies, making its way onto numerous AFI Top 100 lists alongside many of director Hal Ashby's other standout satires, including The Last Detail, Shampoo, and Being There. 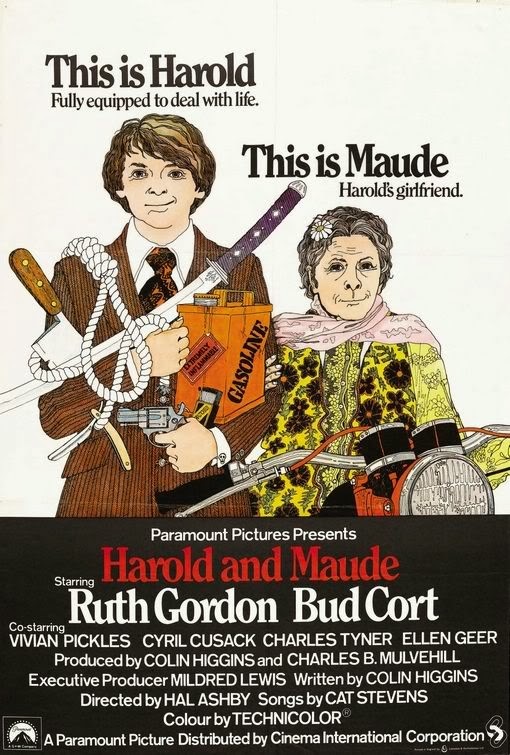 Starring Bud Cort as the death-obsessed 20-something who regularly stages elaborate suicides, and Ruth Gordon as the life-loving 79-year-old he becomes involved with, Harold and Maude is, like M*A*S*H, an early attempt at mixing genres, alternating black comedy with romance, satire, slapstick, and a beguiling sweetness. It's mainly because of this changeability—and Ashby's reverence for even his least-likable characters—that the film transcends a by-now predictable premise (death-lover meets life-lover), while its portrayal of a young man infatuated with a much older woman provides a still-controversial edge. Gordon's performance and collection of quirks toe the line between convincing and cloying, but only because we've met similar characters in the years since. Mostly she nails it. Cort, his ghoulish pallor and deadpan demeanor suggesting a cross between Wes Bentley in American Beauty and Winona Ryder in Beetlejuice, isn't quite as consistent. But if he occasionally overplays the smaller dramatic moments, he rarely fumbles the larger ones (especially the comedy). With comic scenes ranging from smart and sly to cartoon-large, Harold and Maude can still bring belly laughs. Has there ever been a May-December romance so odd, subversive, and touching? One of the seminal '70s car chase movies, starring Peter Fonda, Susan George, Vic Morrow, and a lime Dodge Charger. Great nihilistic fun. Full review now posted. An elderly woman in Manhattan's diamond district points accusingly at a balding, harmless-looking white-haired man and cries, "Szell!"... A panicked graduate student in sweats is chased by a car through nighttime city streets, his heart pounding, his world flipped upside down... Strapped to a chair, the same young man is calmly asked, "Is it safe?" as dental instruments are laid out ominously before him. He has no answer. It's a nightmare come to life. "Is it safe?"... Marathon Man is filled with scenes impossible to forget. Directed by John Schlesinger from a script by William Goldman (based on his own book), the film takes its time setting up a very believable reality, then builds in intensity with discretely staged scenes of escalating menace. Its English-born director brings the same eye for urban detail that distinguished 1968's Midnight Cowboy, while legendary cinematographer Conrad Hall (In Cold Blood, American Beauty) seems able to light scenes with nothing but shadows and dread. An excellent Dustin Hoffman may be a tad old for the character of Babe, but he brings a convincing innocence to his threatened everyman, whose idealistic pacifism is contrasted nicely with older brother Doc, a steely undercover government agent played with toothy charm by Roy Scheider. Opposing them both is ex-Nazi Christian Szell, who has a thing for diamonds and rogue dentistry and is embodied by a terrifying Laurence Olivier (nominated for an Oscar in arguably his most memorable film role). Both a time capsule of mid-1970s New York and a moody, disquieting reflection on the final remnants of Nazi Germany grasping for survival in the new world, Marathon Man is first and foremost an intelligent, adult thriller still capable of making you grit your teeth in fear. 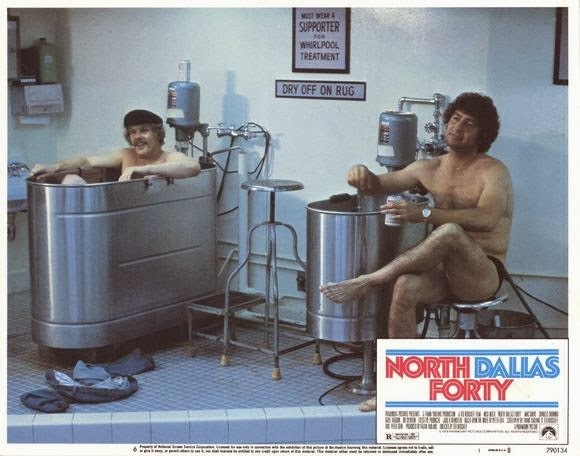 The 1970s were also a good decade for professional sports movies, from Brian's Song (1971) to Fat City (1972), Rocky (1976), Pumping Iron (1977), Slap Shot (1977), and, at decade's end, North Dallas Forty. The last three in particular pulled no punches about the darker sides of their respective sports, and North Dallas Forty, based on Peter Gent's semi- autobiographical novel, is downright bracing in its portrayal of the brutal realities of bodies bludgeoning each other for a living. 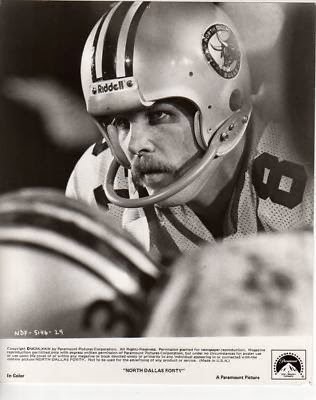 The film focuses on Nick Nolte's battered wide receiver, Phil Elliott, who plays on a hard-playing—and even harder partying—Dallas Cowboys-like football team. Elliott is on the downside of his career and isn't exactly liked by management, but his magic hands in clutch plays mean he still warrants a grudging spot on the reserve bench. It also helps that star quarterback Seth Maxwell (Mac Davis) is his best bud, leaving the team's trainers and coaches to turn a blind eye to their abuses—which include everything from an ever-present lit cigarette and can of Bud to the requisite pot, women, and painkillers. Especially painkillers. Without them, it seems, most of the team couldn't function, especially Elliott—a situation management is happy to encourage. Elliott's overly tenderized physique looks more patched together than Frankenstein's monster, and Nolte does a great job of conveying the constant pain and weariness his character endures. There's a bruised nobility to his perseverance within a machine that chews its players to confetti even as he wonders at the physical price he's willing to pay and how much of his individualism must be compromised. The tension between the joyful, therapeutic aspects of the game as felt by the players and the enormous pressures put on them to succeed makes for a raucous, cynical, funny, and sobering look at professional football in an era when the rules were still being written. What's on WHAT'S ON NETFLIX NOW?